Aditya Chopra's last outing as a director was Mohabbatein. The film, which starred Amitabh Bachchan and Shah Rukh Khan, brought Big B back in the reckoning. Eight years later, when it seems like the Chopras themselves could do with some resurrection, who do they turn to, but Shah Rukh Khan! Khan plays a government servant Surinder Sahni who lives a fairly uneventful life in small-town Amritsar. On his deathbed, Surinder's professor urges him to marry his only daughter Taani (Anushka Sharma) who is yet to recover from her fiancé's death. Caught in this rather awkward situation, the two people start their newly married life by living in separate bedrooms, hardly speaking and sharing very little in common. While Surinder is head over heels in love with his bride, Taani continues to remain holed up in her room. Surinder who seems clueless of how to make his wife smile, finds solace in Bollywood cinema. But while watching a film he realises how much Taani loves Hindi films and its heroes. Meanwhile, the once bubbly and cheerful Taani learns of a dance-training programme and asks her husband's permission to participate in it. Surinder is so desperate to win Taani's heart and see her smile again, he undergoes a complete transformation courtesy his loyal friend Bobby (Vinay Pathak). In his new improved avatar, Surinder sneaks into the dance class just to catch a peek of his wife. As luck would have it, he ends up becoming her dancing partner and introduces himself as Raj. A complete opposite of Surinder, Raj is an OTT Punjabi boy who wears tight jeans, garish t-shirts and bright sunglasses even when it's not sunny outside. Unlike Surinder, he also goes all out to display his feelings for her and knocks off the power supply of half the town just to say the three words. And that's when things change for the worse. Despite his assurances, Taani tells him that everything from that point nothing would ever be the same. Because Taani has fallen in love with Raj not knowing that he and her husband are the very same person. How Taani comes to terms with her feelings and who – Raj or Surinder – walks away with the girl form the climax of the story. Rab Ne Bana Di Jodi starts off from where most Yash Raj films end. The boy (or in this case the man) and the girl are in fact shown married in the first frame itself. It is how they cope with each other is what the movie is all about. Rab Ne also moves away from the typical Yash Raj films format in many more ways. It is set entirely in small-town India. So there are no foreign locales or skimpy skirts and definitely no swanky apartments with bathrooms the size of football fields. In a sense, Anushka Sharma comes across as a perfect choice for such a film. A complete fresher to showbiz, Anushka does a convincing job playing the vivacious girl who has lost her love and her father. Playing the pretty-looking Taani, Anushka is every middle-class boy's dream partner come true – when she finds her husband's colleagues have invited themselves over, she keeps her sorrow aside and plays the perfect host. She also cooks and cleans for him. And guess what, she's one helluva dancer and can pack a punch on a motorbike too! 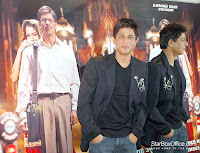 Shah Rukh Khan plays a double role of sorts. While on the one hand he is the simpleton working for Punjab Power on the other he is the hero his wife dreams of. During the day he keeps a nine-to-five job. But once the sun goes down, Surinder becomes Raj who grooves with Taani, engages in a gol-gappa eating competition and doesn't hesitate to show his innermost feelings to her. The 40-something SRK shows just why he is called King Khan as he carries off the two roles almost effortlessly. What is striking is that each time he changes his attire his body language also undergoes a drastic change. Dressed in tight clothes, he is the macho Punjabi lad with coloured hair, driving around the latest bikes, confident and always flirtatious. But once he gets into his off-white shirt, cream trousers and specs he slouches, takes hesitant steps first towards the dining room and then to his room upstairs. Towards the end the two characters appear almost once scene after another. Yet never once do you see Shah Rukh blurring the lines. Surinder's slouch and his subtle ways of showing his love to Taani make your heart go out to the man willing to go to any extent for his wife's happiness. Despite its simple storyline (that seems to be a distant echo of Hrishikesh Mukherjee's Gol Maal and it's moustache plot) Rab Ne Bana Di Jodi fails to hold your attention beyond a point. At about 2 hours and 40 minutes, Rab Ne is far too long for today's short film audience. Jodhaa Akbar, the other long film of the year, at least had the opulence, a good-looking lead couple and some fantastic music score by AR Rahman to fill up the timeline. Here the songs – except Haule Haule – slacken the pace further. Then again there are bits, which could have well been done away with. Why for instance do Yash Raj films have the recurring Dhoom theme is beyond me. Roadside Romeo had it so did Bachna Ae Haseeno. We all loved Dhoom and its sequel. But c'mon Adi, don't tell us it's what you associate Yash Raj with the most. Age has begun to show on Shah Rukh's face and it's evident he has been undergoing something to keep his looks intact. That is probably one of the reasons why close shots of the Khan don't necessarily work. In troubled times like ours we could all do with a love story like Rab Ne Bana Di Jodi. Agreed, the film could have been far, far shorter and simpler, but watch this solely for Shah Rukh Khan. If you aren't his fan already, chances are you'll become one. I am Shahrukh Khan, the king of Bollywood. Catch me on http://www.shahrukhkhan.eu for lates movie and video.